There's nothing quite like some well crafted leather boots. I was fortunate enough to stumble across these beauties when I was visiting Barcelona a few years ago. They're still in great condition and have comfortably formed to my feet over time. To avoid having leather crack, wrinkle and show its age, you have to treat it like your actual skin. This means proper cleansing and moisturizing.. but not nearly as often, of course. Cleaning frequency will really depend on the weather and wear time, but it's pretty obvious when your shoes are in need of a clean. I have two incredible products that make leather care quite simple. 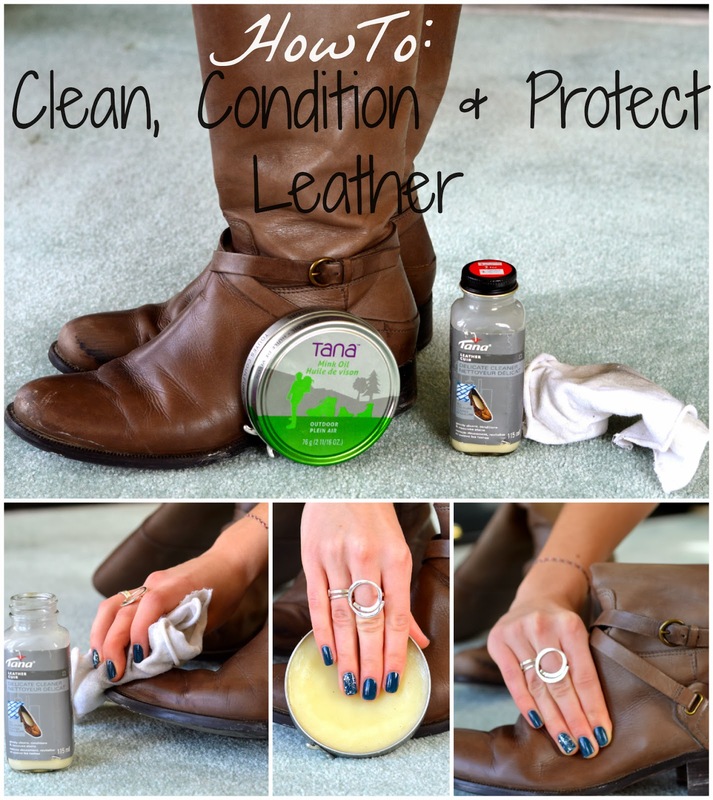 They're both by Tana, one being the delicate cleaning lotion and the next being Mink Oil. I bought these a few years ago, so the packaging has changed a bit. You can find these products at most shoe stores. They're around $10 and literally last for years. Bargain, I'd say. First step: Brush off all loose dirt on your shoes, using baby wipes to dissolve the more stubborn stains. Then pour a loonie sized dollop of cream cleaner onto your rag and rub in circular motions to remove deep salt stains and scuff marks. Second step: After the cleaner has dried, pick up some mink oil on your fingers and begin to massage it into the leather. This balm-like oil must be warmed up and worked into the leather, like you would with hand lotion. You don't need a lot, but you definitely need to massage it in until it has been absorbed. It isn't harmful to your skin at all, and actually leaves your hands feeling quite soft! Make sure to still wash your hands after this step though. Easy as that! Your leather will now be fresh, moisturized and water-repellent. Make sure to dry off and clean your leather as soon as possible if it gets attacked by the winter salt and snow. Over time, salt will eat away at the leather and cause it to get dried out and permanently damaged. This cleaning routine might seem like a bit of a drag, but the results are definitely worth the effort.